Abstract tattoos are for those who are tired of the traditional styles. And also for those who want something new. If you like to experiment and do not wish to be typical, abstract tattoos are perfect for you. This type of tats are very artistic and do not aim to imitate reality. It is very similar to abstract artworks. At first sight, it may seem like abstract tattoos don’t have any deeper meaning. But, they usually have much more than appearance. If you’d like to know more about abstract tattoos and get some inspiration, keep reading! Calligraphy style tattoo on the arm. Another watercolor brush stroke by Georgia Grey. 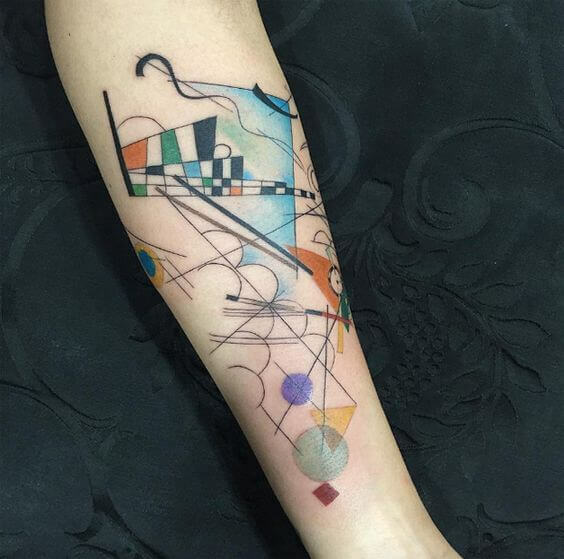 Abstract tattoo on the arm by Amanda Wachob. What do abstract tattoos mean? Abstract tattoos refer to designs that look more like pieces of art themselves. It’s not that other types of tattoos have nothing to do with art, but in this case, it’s something more. Abstract tattoos do not try to imitate or to picture anything real. It usually expresses the emotion or a feeling. Violet and pink watercolor brush stroke tattoo by Georgia Grey. Small abstract tattoo on the inner arm. Black paint brush stroke tattoo with red dots by Tim Mueller. Black geometric abstract tattoo on the forearm. Abstract watercolor tattoo on the wrist. Just like the abstract art, abstract tattoos use the visuals of shapes, forms, and colors to create a composition. This composition will not relate to anything that exists in the real world. Abstract artworks are always beautiful and aesthetic. That’s because they usually consist of lots of colors, lines, and shapes. 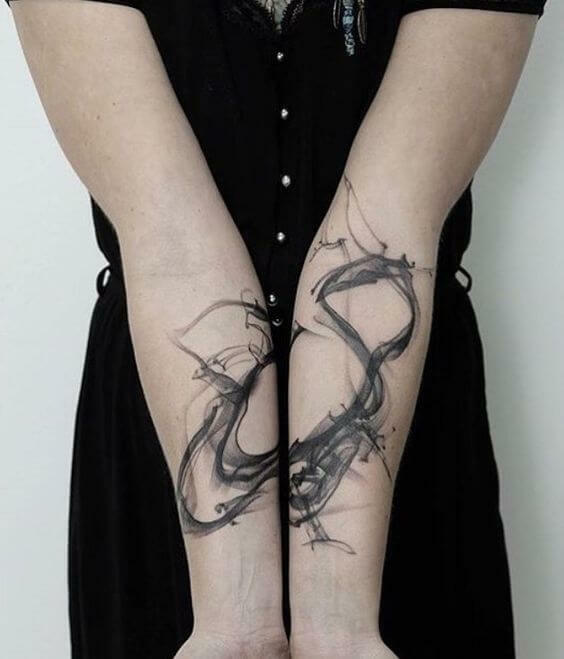 Smoke-like abstract black tattoo on the wrist. Colorful abstract tattoo by Kizun. Black abstract tattoo on the inner arm. Abstract watercolor circular brush stroke tattoo by Georgia Grey. 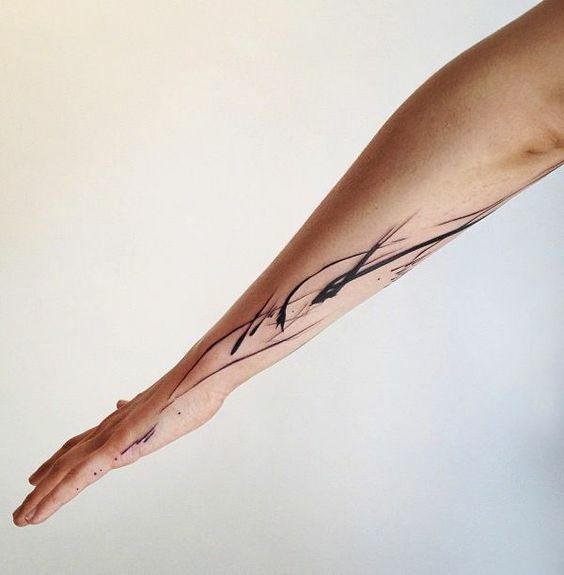 An abstract line tattoo on the arm by Vaigirdas Kofy. Abstract tattoos are the best way to express your emotions in a very subtle way. It will not reveal your feelings just by looking at it. But an experienced eye will understand its meaning very quickly. By using color, shapes, and lines, you can create an incredible artwork that will stay with you forever. With an abstract tattoo, you can express anything you want. You can dedicate it to any person or to something that you love more than anything else. Moreover, it can protect the meaning if you don’t want to reveal it. Another beautiful thing about abstract tattoos is that they are suitable for both men and women. We don’t think it can ever become tedious because there are endless possibilities of abstract tattoo designs. In fact, you can create the tattoo by yourself – take a brush and canvas and start painting. You will feel powerful emotions! Black abstract dot-work tattoo on the right arm. Artistic abstract tattoo on the side. Abstract tattoo on the leg by Amanda Wachob. A tattoo tribute to Le Corbusier by tattoo artist Mirco Campioni. Abstract tattoos are getting more and more attention, especially in the past few years. That’s because of the new techniques which allow the artists to improve their skills and abilities. That’s why so many artists started to experiment with abstract forms. Minimalism style tattoo by Okan Uckun. Freehan brushstrokes tattoo on the back. Excellent brush stroke tattoo on the inner arm by Amanda Wachob. Blackwork abstract tattoo on the right inner arm. Black dot-work gradient tattoo on the inner arm. So, as we were saying, this type of tattoo is unisex. Women admire them because of the mystery and sensuality that they hide. And because of the uncomplicated designs, you can apply these tattoos almost anywhere on your body. Although women mostly prefer minimal abstract watercolor tattoo on the back, thigh or sleeve. As for the men, we suggest experimenting with more rough designs. Men tend to tattoo larger pieces on their backs, chests, legs, and arms. If you don’t know what kind of abstract tattoo you want, check out our collection of ideas below. Try to experiment and sketch some designs by yourself. In this way, your tat will be even more unique. Don’t forget to show the ideas you like to your tattoo artist. He can then combine those into something unique and specific to you. Circles and lines tattoo on the inner arm. Black, yellow and blue abstract tattoo on the forearm. Abstract art tattoo on the inner arm. Sweet blackwork calligraphy tattoo on the forearm. Abstract calligraphy tattoo on the arm by Teti Malik. Cubism style abstract tattoo on the thigh by Mariusz Trubisz. Abstract composition tattoo on the arm above the elbow. Brush strokes and color splashes tattoo on the arm. Abstract mixed colors sleeve tattoo design. Brush strokes tattoo on the shoulder blade by Amanda Wachob. Black abstract tattoo on the inner arm by Vassily Kandinsky. 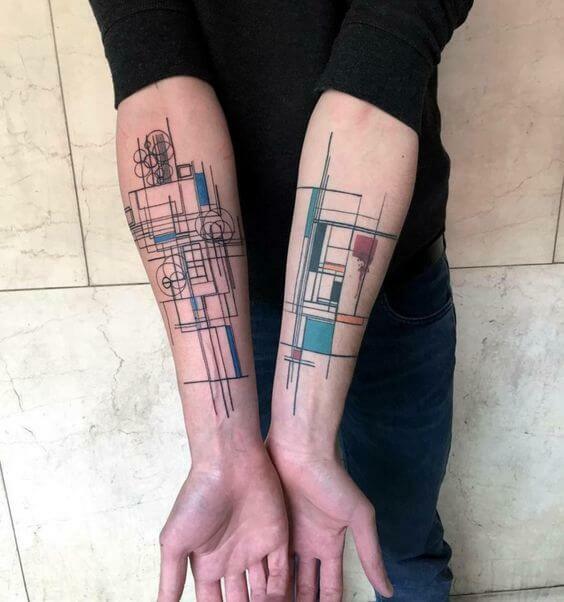 Geometric abstract tattoo on inner arms. Black abstract tattoos on forearms. Subtle abstract tattoo on the inner arm by Amanda Wachob. Wonderful colorful lines abstract tattoo on the arm. Solid black abstract tattoo on the arm. Cubist and abstract style tattoo on the leg by Mike Boyd. Dark abstract tattoo – another excellent work by Amanda Wachob. Lines and circles abstract tattoo on the arm. Another colorful abstract arm tattoo. Lines and colorful circles tattoo composition. Different art styles combined in this excellent art piece. Paintbrush stroke tattoo on the shoulder and chest. Smoke tattoo on both arms.